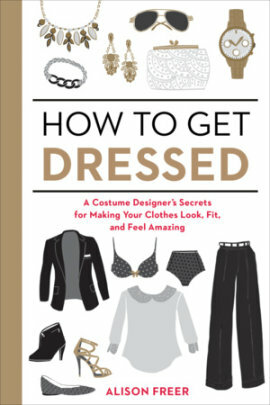 "How to Get Dressed" by Alison Freer was laying on my shelf for over a year. When I got it from Blogging for Books last summer, I had really high expectations. I was looking forward learning all about, well, dressing up. I wanted to know how to find my style in my wardrobe. How to mix and match various garments, patterns and colors. Learning about timeless pieces and statement pieces. The author came well recommended, too. With years of experience as costume designer for Hollywood, who would know better? First, the author's writing style did not go well me at all. I did not relate to her, nor to her humor. Personal preference, yes, but it made it hard to continue on reading. Next, there are hardly any illustrations in the book. Here we are, in chapter 2, talking about blouses, dresses and jackets, and the previous knowledge or using Google is required to figure out what styles we are reading about. Very disappointing. Yes, granted, there is a number of good advice, even in those two and a half chapter I read. For example the suggestions of taking your new purchase to alterations shop for perfect fitting. By itself, it did not make me want to continue on reading. Page 42 is as far as I went, and the book was on the shelf since.